Berkeley Lab’s participation in a new study, detailed June 11 in the journal Proceedings of the National Academy of Sciences (see related news release), focused on the chemical composition of tiny glassy grains of interplanetary particles – likely deposited in Earth’s upper atmosphere by comets – that contain dust leftover from the formative period of our solar system. More than a decade ago, NASA’s Stardust spacecraft mission, which had a rendezvous with comet 81P/Wild 2, returned samples of cometary and interstellar dust to Earth. Ever since, researchers have been working to study this material in detail. In one study, published in 2014, scientists used X-rays and infrared light to study particles from this mission. In another study, published in 2015, researchers studied two comet particles using several high-resolution electron microscopes and a focused ion beam at Berkeley Lab’s National Center for Electron Microscopy (NCEM), which is now part of the Molecular Foundry. They found that the microscopic rocks, named Iris and Callie, had formed from molten droplets that crystallized rapidly in outer space. In other studies, the ALS has been used to reveal liquid water and complex organic compounds like hydrocarbons and amino acids in meteorites – one of which may have traveled here from a dwarf planet – and ALS scientists have been working with NASA to study the microscopic makeup of asteroids to better understand how meteoroids break apart in Earth’s atmosphere. 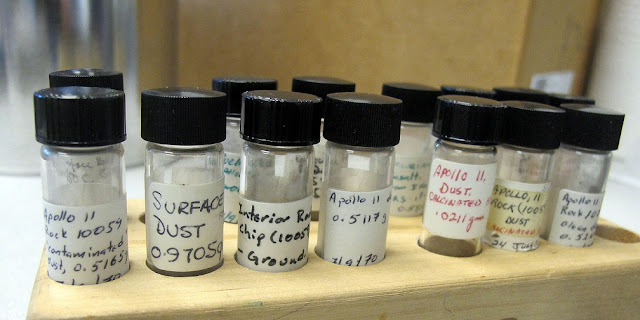 The Lab also had a role in analyzing dust from moon rocks collected in the Apollo 11 and Apollo 12 moon missions – the late Melvin Calvin, who was a former associate director at the Lab, participated in a study of carbon compounds in lunar samples that was published in 1971. And in the 1970s, Berkeley Lab Nobel laureate Luis Alvarez teamed with his son, Walter Alvarez, then an associate professor of geology at UC Berkeley, to unravel the mystery of the dinosaur die-off some 65 million years ago. The Alvarezes, working with Lab nuclear chemists Frank Asaro and Helen Michel, used a technique known as neutron activation analysis to precisely measure an unusual abundance in the element iridium in sedimentary deposits that dated back to the time of the dinosaurs’ disappearance and the mass extinction of many other species. Iridium, which is rare on Earth, was known to be associated with extraterrestrial objects such as asteroids, and later studies would confirm that a massive meteorite impact is the most likely cause of that ancient extinction event. Besides studying materials of extraterrestrial origin, Berkeley Lab researchers have also worked to synthesize and simulate the chemistry, materials, conditions, and effects found outside of Earth – from lab-treated materials that are analogous to exotic minerals that formed in space from the presence of corrosive gases in the early solar system to simulated mergers of neutron stars and black holes, and the creation of simulated Martian meteorites.